T-Rex Toe Claw. 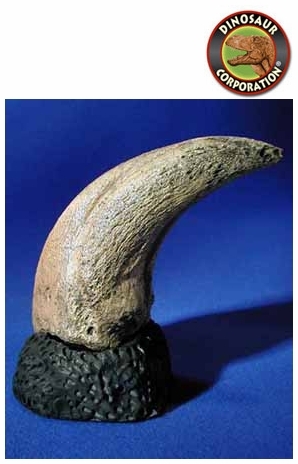 Dinosaur toe claw fossil replica. Cretaceous South Dakota. Tyrannosaurus rex was one of the largest land carnivores of all time; the largest complete specimen, FMNH PR2081 ("Sue"), measured 12.8 meters (42 feet) long, and was 4.0 meters (13 ft) tall at the hips. Although Tyrannosaurus rex was larger than the well known Jurassic theropod Allosaurus, it was slightly smaller than Cretaceous carnivores Spinosaurus and Giganotosaurus.